The most common signs of Diabetes are frequent urination, weight loss, lack of energy, and/or excessive thirst. Diabetes is a one of the most common diseases affecting the world population today. In fact, the number of people being diagnosed with diabetes is steadily increased. In 2013, approximately 382 million people were living with diabetes and this number is only expected to increase. It is estimated that by 2035, there would be 592 million affected by diabetes. In 2012 and 2013, 1.5 to 5.1 million deaths annually were credited to diabetes. With those kinds of numbers, it is no surprise that doctors list diabetes as the 8th leading cause of death in the world. As there is no cure of Diabetes, the only way is prevention. While prevention is the best, at times it may already be late for some, in these cases early diagnosis may help save their life as one can live a healthy life by managing their condition. However, in order for early diagnosis, one must be aware of the symptoms so as to know when to go in for a doctor’s check up. 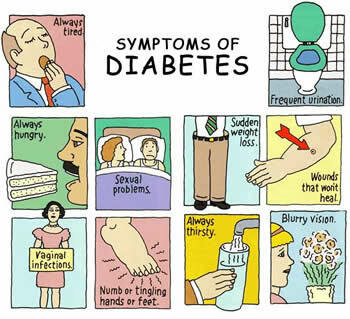 So what are the symptoms of Diabetes? The most common symptoms of Diabetes include unexplained weight loss, lack of energy, tingling or numbness in the arms or legs, and frequent urination, which leads to dehydration and excessive thirst. In addition to these, some people might also experience blurry vision, headache, fatigue, swollen or tender gums, itchy skin, genital itching, rashes, recurrent infections, slow healing of cuts or wounds, and/or sexual dysfunction. These symptoms might develop rapidly over the course of weeks or months. If this happens, it is likely that the person is suffering from Diabetes Type 1. However, if these symptoms develop slowly taking months or even years, it is likely that the person is suffering from Diabetes Type 2, which is the most common type of Diabetes accounting for approximately 90% of all diabetic cases. However, irrelevant of the type of diabetes, the most common and definitive symptom of diabetes is a high blood sugar level, which can be easily checked by a blood test.